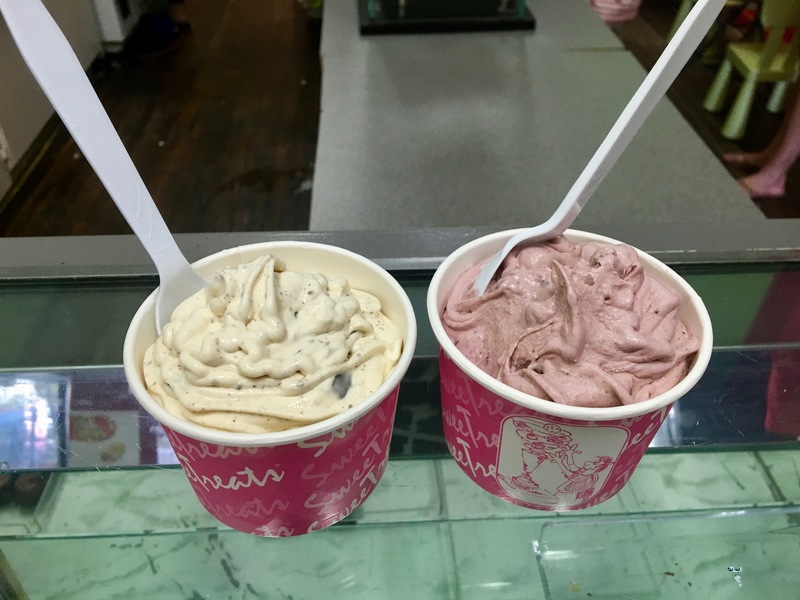 Sure, winter is on the way, but it’s been pretty warm lately, and Date Night believes in supporting our local ice cream store. One of those frozen treat establishments happens to be on the square in Marietta. 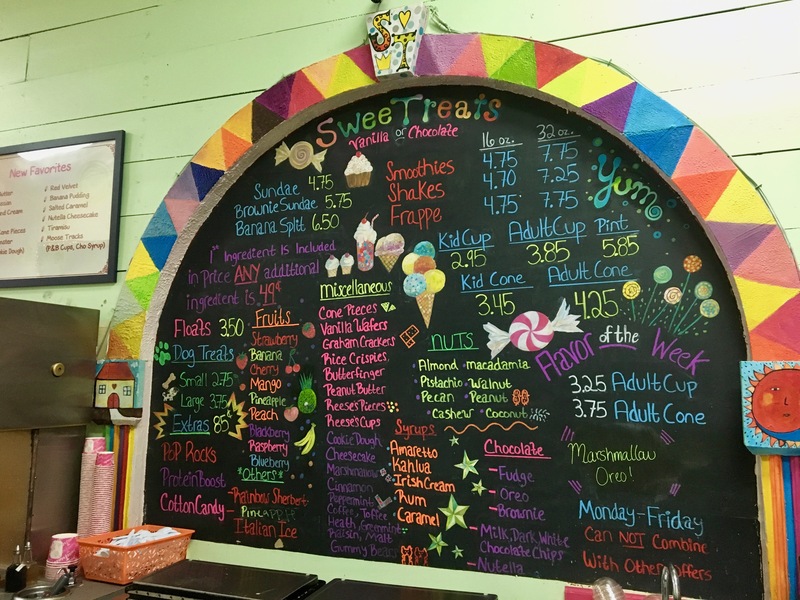 SweeTreats (yeah, they really spell it that way) isn’t the only ice cream store on the square, but it may be the best. The concept is pretty simple. They have a chocolate base and a vanilla base. You choose the ingredients to build your ice cream any way you want it. As you can see by the menu, the possibilities are endless. You could eat here every day and not even come close to repeating yourself. Our waistlines probably could not handle that. However, we will tell you that it’s tough to make a choice. No pressure though–it’s pretty hard to screw up as just about anything is good in ice cream. Well, maybe not pop rocks, but if you like them, go for it. After you choose your ingredients, they put your ice cream into a super-duper blender machine and mix it up. The first ingredient is free. You pay 49 cents each for any other stuff you decide to add. 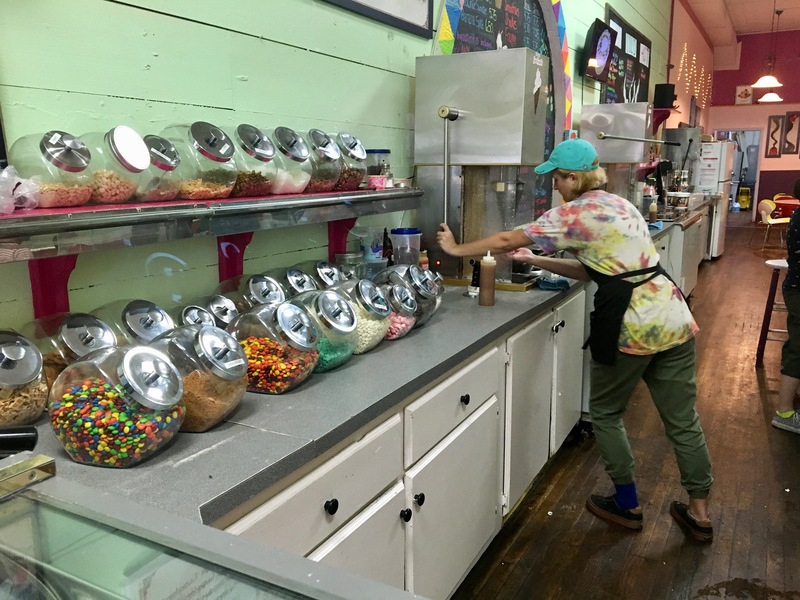 The girl operating the machine actually put her entire weight behind the lever to make our cups of ice cream. Maybe they need some heavier employees or a machine that’s easier to run. I usually get a cup because evidently my mother, who reads this blog, did not teach me how to “lick and turn” as a child. Our choices came out like this. Eve puts amaretto flavoring and chocolate chips into hers. I put cherries and peanut butter cups in my mix. The result is quite delicious. The ice cream is thick and the ingredients are well-mixed without any lumps. Eve hates lumps. That machine does a great job. We’re glad we stumbled into SweeTreats. 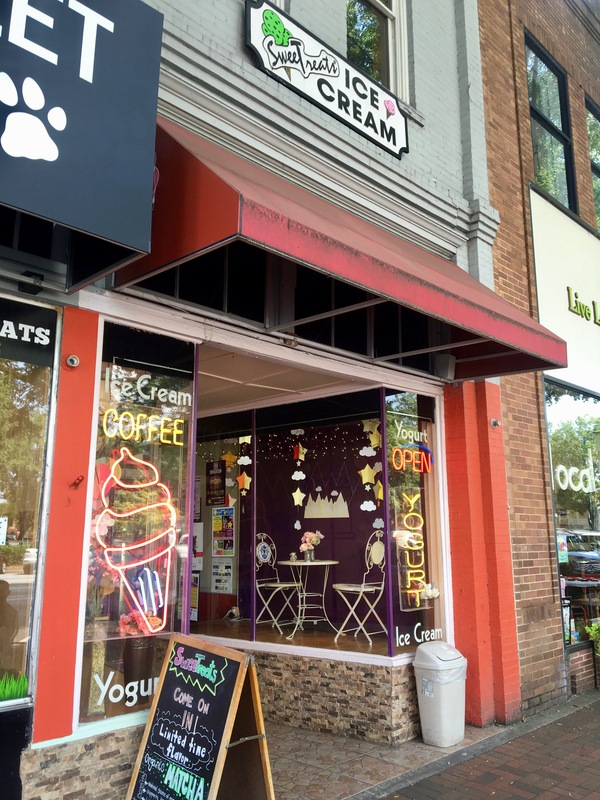 We’ll be back the next time we want a yummy dessert on the square in Marietta. I’m a “sugar cone girl” myself. Always love biting the bottom off and get the very last drop of ice cream out. Yum! !